BMW Motorrad announced a new program today, under the ‘Rent a Ride’ moniker. As you can probably guess already, the new offering is meant to give customers the chance of renting a BMW bike straight from the local dealers, for a short time. In order to make things easier for the customers, BMW Motorrad set up a website with smartphone capability, which allows you to select the model you want and check availability in real time. The service is already operational but only in a couple of countries in the EU right now. 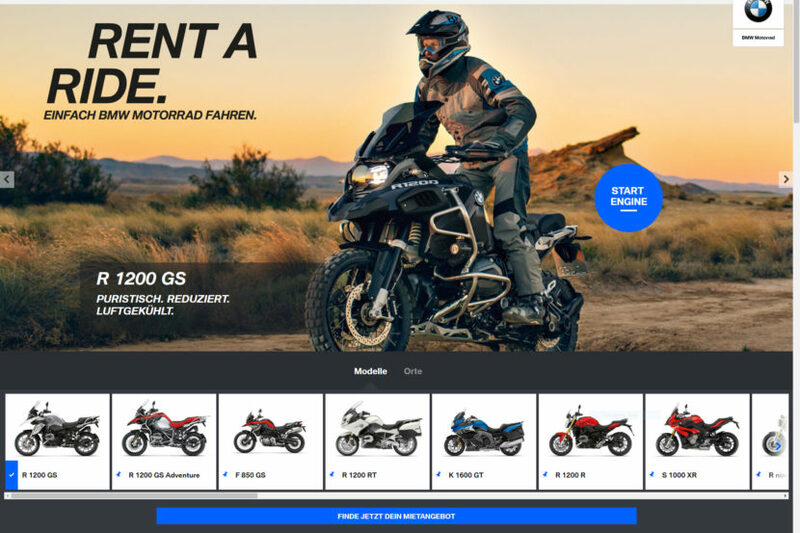 For the moment you can use rentaride.com to check out if your preferred bike is available at dealers in Germany, Austria and France and, for now, there are only two selected BMW Motorrad sales partners in each country. “This new mobility scheme gives our customers an attractive and straightforward way of familiarizing themselves closely with a wide range of our BMW motorcycle models on a non-binding basis – by taking a weekend trip, for instance,” said Henning Putzke, Head of BMW Motorrad Germany. The vehicle booking can be finalized in the customer’s selected region – complete with matching accessories and rider equipment if required through the website and using your smartphone, in a couple of minutes. The selected motorcycle is then prepared for pick-up at the BMW Motorrad dealership in advance and the customer is given a professional briefing. This is one way BMW is trying to expand its future-oriented activities in the area of mobility services. “Mobility services are a future focus area that forms one of the cornerstones of our corporate strategy. By offering Rent A Ride, BMW Motorrad is advancing the BMW Group’s development towards becoming a customer-oriented mobility company. If the first season of Rent A Ride goes according to expectations, the aim will be to expand the scheme to cover the full extent of the BMW Motorrad sales network,” said Timo Resch, Head of International Sales and Marketing BMW Motorrad.